Performances in/of the Everyday: St Patrick’s Day Parades, Pub Crawls, Sports, Concerts, Newspapers, Religious Rites and Sectarian Riots, Political Theatre, Protests, Lecture Theatres, Digital and Social Media, etc. 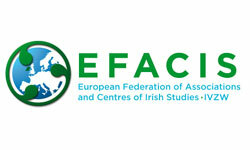 The EFACIS conference is an interdisciplinary Irish studies event and welcomes submissions from all disciplines on any Irish Studies topic or theme. This conference is dedicated to the memory of the late Professor Werner Huber (University of Vienna) and draws inspiration from his pioneering interdisciplinary research interests and great contribution to the development of Irish Studies. EFACIS is offering four Werner Huber Travel Bursaries to the value of €200 each to postgraduate students who wish to participate in the EFACIS 2019 conference in University of Ljubljana. Please find information below regarding the documents required and criteria for assessing those who wish to be considered for a scholarship.  350 word document outlining reasons for applying for the EFACIS Bursary.  2 references from academic staff – one of whom should be your supervisor – in your home institution.